The Dow Jones Industrial Average on Wednesday closed above the psychologically significant threshold of 20,000. Finishing at the level represents a milestone for the blue-chip gauge and highlights a relatively speedy path higher for the stock market in the wake of Donald Trump’s election win in November. The Dow DJIA, is up about 9.5% since Trump’s Nov. 8 election victory, the S&P 500 index SPX, has gained nearly 7%, while the Nasdaq Composite Index COMP, has advanced roughly 9% during that period. Will it go higher? I don't know. Generally stock prices go up as the underlying earnings go up. I'm skeptical of emotional buying. On previous milestones. See this Wiki list and the chart below. Historically, the stock market tends to gain about 7% annually, inclusive of dividend reinvestment. This means the major stock indexes tend to double in value about once every decade, and that the natural trend of high-quality stocks over the long-term is to head higher. 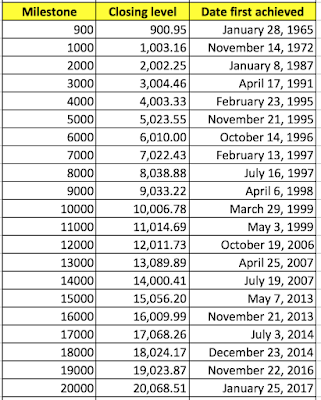 Of course, sometimes it takes longer than others for major indexes to hit arbitrary milestones. 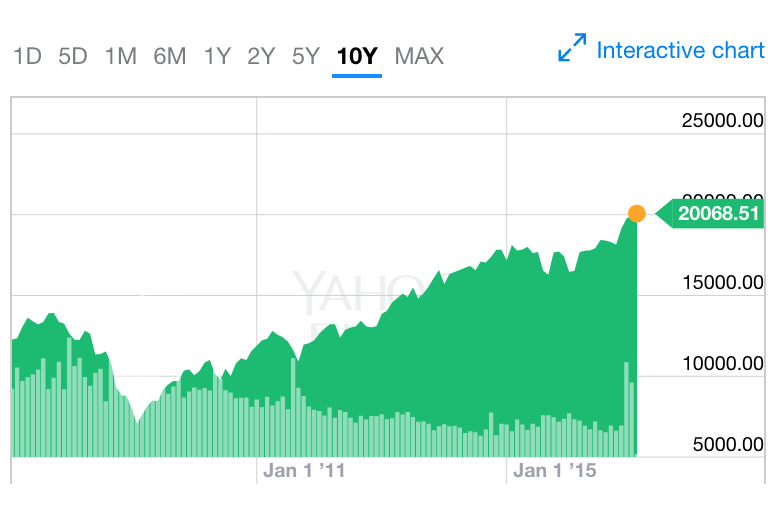 It took the Dow only three years and five months to head from 5,000 to 10,000. 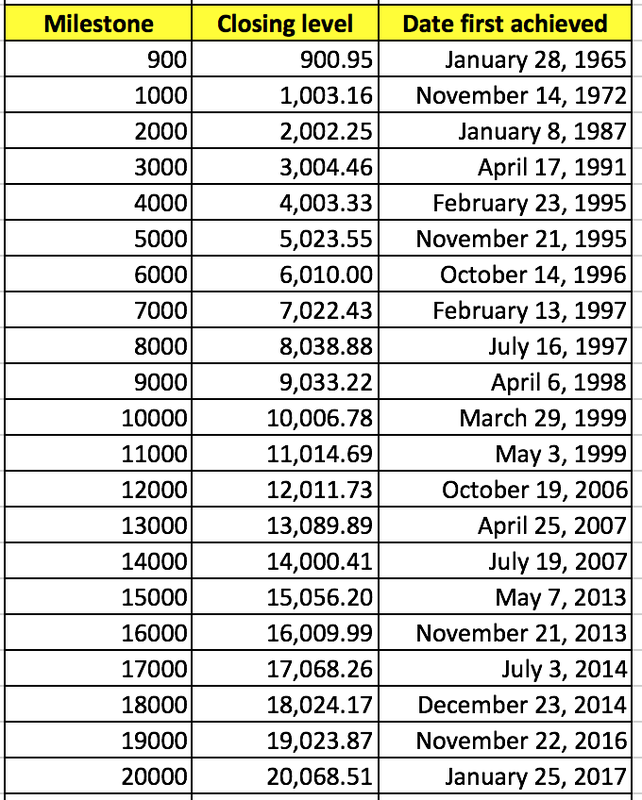 However, it took more than 17 years for the Dow to move from 10,000 to 20,000. Once again, these are arbitrary figures I'm using for illustrative purposes only, but if you'd have bought stocks at regular intervals over the past 17-plus years, chances are that your average buy in would have you up in excess of the 100% return in the Dow between March 29, 1999, and Jan. 25, 2017. 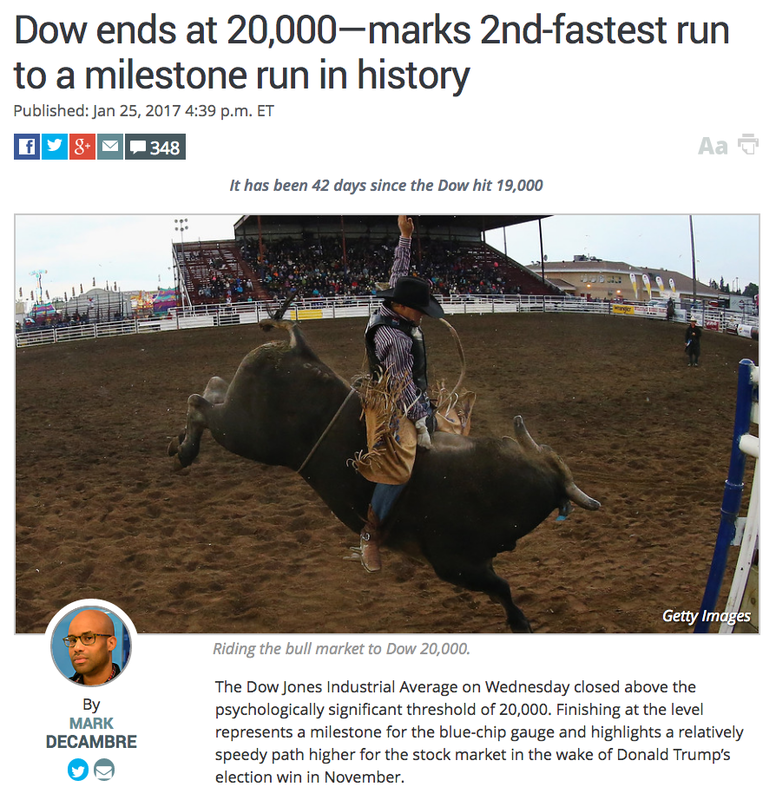 Focusing too much on the Dow Jones's achievement also overlooks the inherent flaw of the Dow: its focus on price instead of market cap weighting. Hope and pray that the enthusiasm is backed by fundamentals....or becomes backed by fundamentals soon. Otherwise it could be a rough ride.